Bambi’s children are named Geno and Gurri. Geno is his son, Gurri his daughter. I know this rather obscure fact because I spent the morning reading a beloved book from my childhood — Bambi’s Children, The Story of a Forest Family. 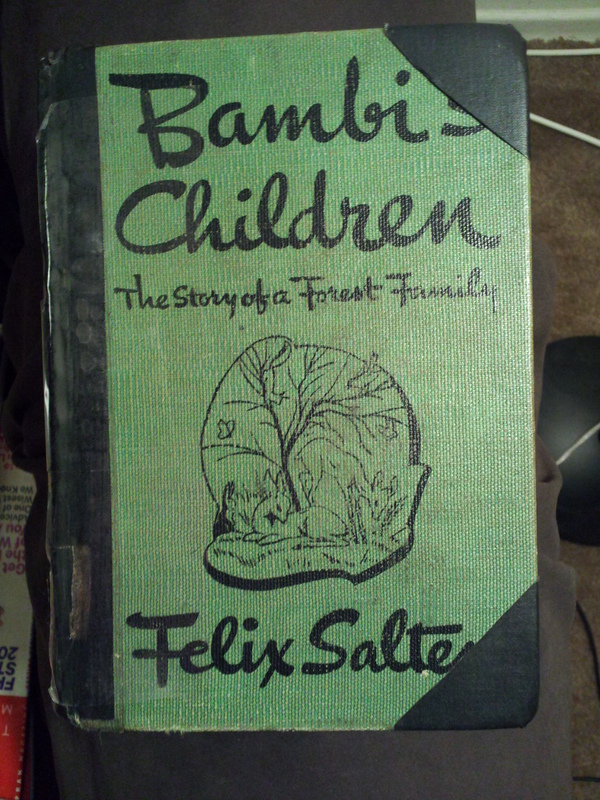 Yes, Felix Salten wrote a sequel to his famous book Bambi. I had read it, over and over, when I was young, but then I moved, and I was never able to find another library with a copy that could be checked out and read. Until last week, that is. I was picking up two of Albert Payson Terhune’s Sunnybank books from the historical collection of my library system. The librarian and I began discussing classic children’s books from the turn of the last century, and out of nowhere, she asked if I’d ever read Bambi (the real Bambi, not the shortened version that accompanied the Disney movie) and its sequel. 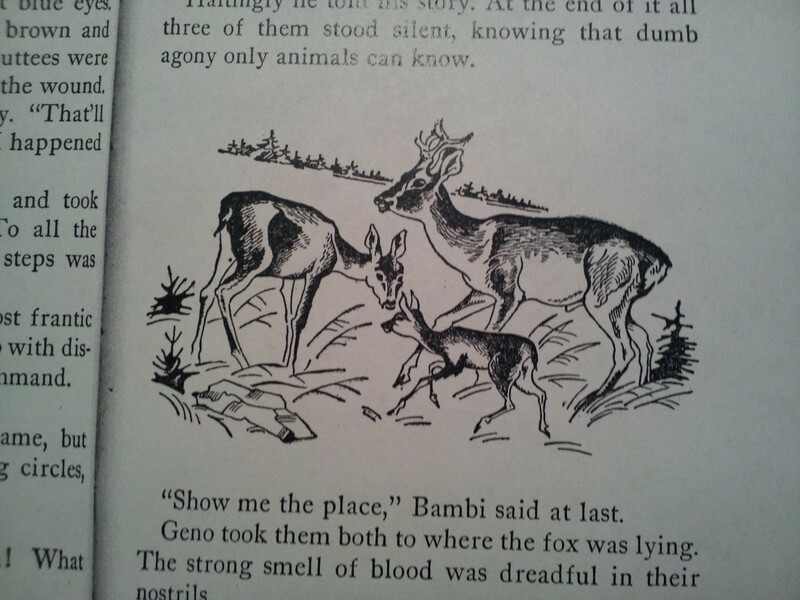 Wait, the library had a circulating copy of Bambi’s Children? When she answered yes, I promptly requested it. I grew up in a small ‘patch town’ in northeasterm Pennsylvania. My friends lived in other patch towns, and while we would meet often, we simply couldn’t spend every day together. My parents, like my friends’ parents, both worked — even then, in those small towns, you needed two incomes in order to maintain a household. Our parents simply couldn’t drive us, every day, to each others’ homes for what we’d call ‘playdates’ today. Bus service between the towns was sporadic, and not always available at a convenient time for a child to go home. And so, to pass the time, I dove into reading. I devoured books. Our library, while small, had a ever-expanding and varied children’s collection. Although my mother worked evenings, every other Saturday we would run errands, and at some point, we’d end up at the library. My mother, who loved to read as much as I did, would browse through the latest histories and historical novels (she was partial to the American Revolution, the Civil War and the kings and queens of Europe), and I would search through the shelves for new books on my favorites topics — mysteries, fantasies, historical stories and most importantly, animal tales. Horses and dogs. Dogs and horses. While I diligently read my way through Nancy Drew and Cherry Ames, Tom Swift and tales from ancient Greece and Rome and Egypt, I kept coming back to the animal tales. Sunnybank collies and Jim Kjelgaard’s Irish Setters. The Black Stallion and his rival, the Island Stallion. Kazan and Baree, wild dogs of the far North. Marguerite Henry’s ponies and trotters and the King of the Wind. I read them all, repeatedly. Then one day, the libarian (and oh, I wish I could remember her name!) asked me if I’d read Bambi. I explained that I’d seen the movie, and had the Disney books, and the coloring books. Ah, she replied, but had I read the sequel? And so I met Geno and Gurri, while renewing my acquaintance with Faline and Bambi, the great King of the Forest. I followed the fawns as they grew up, facing threats from both nature and man. I poured over the illustrations, because all of these books — Bambi and the Black Stallion and Big Red — contained lovely black and white (pen and ink?) drawings, or multi-color plates, that were interspersed throughout the book. And I wondered whether our deer had conversations like the deer in Salten’s books. My house was built on the edge of a forest. In the autumn and winter, whitetail deer would wander into our backyard to eat the fallen apples from our trees. I would sit in the window and watch the herd throughout the evening, giving names to the more distinctive animals. I can still see Blaze in my mind — the deer had a streak of white running down its side. Natural coloring, or a scar, I wonder today. Second obscure fact — Bambi and his family are not whitetail deer, as portrayed in the Disney movie. They are roe deer, native to Europe. Similar to whitetails, but from what I understand, roe deer are smaller, alter color through the seasons and have virtually invisible tails. However, they, like their American cousins, are rapidly increasing in numbers, especially in Britain. I’ve read hundreds of books to my friend’s children over the years, and yet very few of these modern ‘classics’ compare to the simple beauty of books like Bambi and Bambi’s Children. These books were not simplistic — Geno and Gurri lost friends to both man and beast, experienced hardships, learned difficult lessons about ‘adulthood’ — but somehow, they seem more entertaining than so many of the books available today. Bambi’s Children was just as enchanting as I remembered it, and I’ve decided that, while I’m winnowing down my books in favor of digital editions, I have to find a good hardback copy to add to my collection. Certain books are meant to be held and treasured. Of course, I also want a digital copy, so I can read it whenever I want. A digital copy that includes the wonderful drawings. Digitize this book, please! Bambi is already available, its sequel should be as well. Coming home this evening, I passed two herds of deer, standing in the fields, watching alertly as my car drove by them. The second group had 17 deer that I could see (I stopped and counted, while they studied me warily, prepared to run if I moved toward them). The first herd had at least twice that number. Geno and Gurri called their humans “Brown He” and other similar descriptive names. I wonder what my deer would call me, if I could hear their thoughts? Posted in Must Be Digitized! Tagged 111 days of blogging, children's books, digitize me!